There's nothin' like having dessert for breakfast. It's always nice when you can dress up a sweet treat and pass it off as a breakfast food, whether it be cereal that looks and tastes like cookies or pancakes that look and taste like streusel. I guess breakfast is the best time to have those things, because you've got all day to burn off the calories. But this dish wasn't the sugar extravaganza I thought it might be. It's really not that sweet at all. The "cinnamon streusel crunch" added a bit of sweetness, but it baked right into the pancakes themselves and became part of the bread. The pancakes wound up with slightly charred, blackened edges where all the topping was. As far as apple flavor goes, there wasn't much of it. The bread part didn't taste like apple at all. 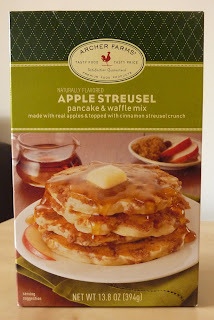 There were a few small bites of actual apples baked into the pancakes, but I think this product could have used a lot more apple pieces. Once you poured maple syrup on the pancakes, the maple-flavor pretty well drowned out the apple-flavor. It didn't taste much like cinnamon to me, either. It had neither the sweetness nor the appliness of apple streusel. They were basically just normal pancakes with a few small apple bits baked into them. This product could have really used an apple-cinnamon flavored syrup. That might have given them just enough flavor and sweetness to warrant calling them "apple streusel pancakes." As they are, I think they're a bit of a let-down, especially if you're hoping for something super-appley. My wife felt the same way. "They don't taste bad," she said. "They just don't really taste like apple streusel to me." I give this product 6 out of 10 stars.